AT&T has a history of aiming at Verizon with its advertising. Taking its HSPA+ footprint and combining it with its LTE coverage, AT&T advertises itself as having the largest 4G network in the country. Now the nation's second largest carrier is using information provided it from a third party source it didn't name, to claim that it has "the highest success rate for delivering mobile content across nationwide 4G LTE networks." In addition, AT&T cites recent studies conducted by PCWorld/TechHive and PC Magazine that show its LTE network to be faster on a consistent basis than its rivals. 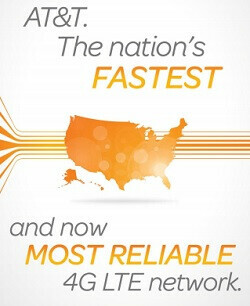 With that in mind, AT&T's print ads call it the 'fastest' and now the 'most reliable' 4G LTE network. What else can the mobile operator do but poke Big Red in its soft spots? Right now, Verizon's LTE signal covers 301 million POPs while AT&T's LTE signal covers 225 million POPs which is expected to rise to 270 million POPs by year end. Last week, AT&T announced that it will be buying Leap Wireless for $1.2 billion or $15 a share. With a large amount of unused spectrum in the PCS and AWS bands that could reach 40 million people, this could be a much desired acquisition for AT&T. But don't count on anything just yet. With Leap's stock price trading more than $2 above AT&T's $15 bid, Wall Street expects a third party to make a higher offer for the owner of Cricket Wireless. Fastest and most reliable doesnt outdo coverage. AT&T is on par with Verizon were I am tho for everything so they are in my radar. What makes AT&T more reliable than Verizon is when their LTE service isnt available!! 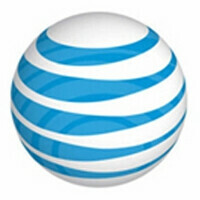 AT&T shifts to HSPA+ whereas Verizon goes to their original 3G service. Thats a big internet speed difference. AT&T isnt perfect, but its better than Verizon to me. Everyone has their own opinion and thats what matters when it comes to where you're going to spend your hard earned $$$ to!! Very true...hspa+ can be very much like 4g, while CDMA is a joke. AT&T was down twice in the Houston area in the last month. But still there a good network. Just wish they had more towers in southeast Texas. i can not wait when Verizon said " We Are the Cheapest 4G LTE in the Nation"
Oh please, AT&Terrible doesn't even work in Union Square / East 14th street in NYC!! How can they be 'faster' if they can't even be 'reliable'??! I still see, from time-to-time, New Yorker hanging out their windows holding metal cans connected with twine!! I just switched from AT&T to Verizon this July and since I'm currently living in LA I can honestly say that Verizon is way better and with a 15% discount on top of my bill the price for my 10GB share everything plan with two smartphones is just as cheap as Sprint's unlimited plan. I will soon find our how they compare now that my work put me on the corporate Verizon Plan. It will interesting to see my IPhone 5 & Note 2 on ATT vs Droid DNA. When it comes to my mifi spot on Verizon and iPhone 5 I see better speeds and reliable LTE coverage. In Las Vegas Verizon has many dead spots on the strip near Monte Carlo and Luxor.